Last week my friend from the Czech Republic was in town. My kids and I went to lunch with her, and we visited an alligator farm. (Yes, there is such a thing.) Zuzana told my children there weren’t alligators in her country. She shared other things that were different, and the kids were amazed. We went to get frozen yogurt, and she taught them some words in Czech. In the end they discovered that even though she lived far away, we all enjoyed the same things. A few weeks before that, another friend and her daughter, who has autism, came to visit. Rachel is much older than my young kids, but within a few minutes they were all playing together. Even though Rachel can say very few words, one of my daughters started a game of hide-and-go-seek. Soon all four children were laughing and playing. My kids hated to see their new friend leave, and Rachel’s mom was so thankful they were welcoming. My kids can’t wait to have her over again! Every Sunday we attend a multi-ethnic church. The people worshiping with us are from all types of backgrounds, have various shades of skin color, and come from various economic backgrounds. Some are even from around the world! We worship God together, and we spend time in community. It gives our family a glimpse of eternity to come. We can all learn something from people from different communities and backgrounds. There are no right or wrong cultures—there are just different ones. Children learn to appreciate others by being around them. 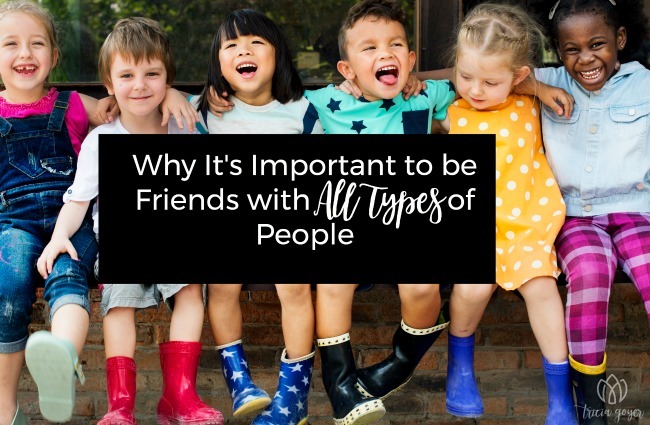 When we meet people ethnically, economically, and physically different from us, we discover how similar we are. Laughter is something we all enjoy. Love crosses boundary lines. Our world is becoming a global community. By the time our children are adults, they will be working and communicating with people from all around the world. Teach them to appreciate differences, and they’ll have a head start. Heaven is a place for all tongues, all nations. In heaven there will be people from throughout history, from around the world, and from all nations. There will be more people who are different from us than similar. How amazing is that?! Heavenly Father, thank you for the diverse and colorful world you’ve created. Remind us to daily celebrate that beauty and seek to connect with others from different backgrounds. Thank you so much for the gift of community and giving us a glimpse of what Heaven will be like one day!